Some people claim they live ‘in’ the internet, but you’ve never lived in the internet until you’ve walked its wireframe halls. And believe me, Tron got it wrong. Instead of massive glowing space invader ships, you’ll be coming face to face with towering memes. It’s all courtesy of World of Reddit, an app for the Oculus Rift that allows you to walk through the social site and see its wonders in full 3D. Welcome to the future of the internet, as envisioned in the early 2000s. The app, which can be downloaded from the developer’s post on the Developer Forums, allows you to use conventional FPS controls to fly through a wireframe, blocky construction of Reddit. It’s all there, with every sub-Reddit represented. 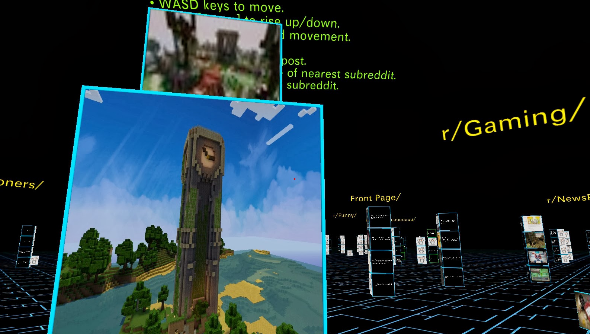 Each post is displayed as a cube, and the more entries on a reddit the taller the tower of cubes. It’s entirely mental, but if you’ve got an Oculus, you can be IN the internet! This is what hackers see all the time, right? Developer Conlan is looking for feedback on where to progress with the software, so if you’re lucky enough to have a Rift and have now explored Reddit in 3D space, drop a word in at Conlan’s blog with your thoughts.